Is there a big banana problem? Banana… A fruit which is healthful for the people and animals… It is very easy; a banana. It is a yellow fruit which is tasteful. People, especially children love it. Animals, especially monkeys love it. Everybody knows the fruit in the world. It makes most of us happy when we eat it. However, it is also a problem in international relations. So why is banana a problem for the world? How can be a simple fruit difficult in trade? What was the argument about? Is banana problem a small or a big problem? My term paper aims to answer these questions, because a banana which is standing innocent in your kitchen, can make crisis in world trade and European integration. It is very interesting and difficult to understand, because most people think that it is just something to eat. The large revenues of the Costa Rican banana industry have come at the expense of one of the world’s most biologically diverse rain forests. Recently, the EU installed a quota system for bananas predominantly from Latin America. The Costa Rican banana industry has been hit hard and the delicate balance between business and environmental protection has been affected. There have been many protests to bring an end to the EU banana quota system, including protests to the GATT. The US government is now at the forefront of forging negotiations in the trade dispute because US fruit conglomerates are suffering, whereas the European fruit counterparts are benefiting. The resolution, if any, of the greater international dispute over world banana trade will inevitably have an effect on ecological/banana industry relationship in Costa Rica. In the UK alone people eat in excess of 140 million bananas a week – that’s around 7 billion a year. I think it is a large number. World wide, the trade in bananas exceeds 2.5 billion tones each year. The popularity of the fruit throughout the world is enhanced by the fact that it is easy to eat, high in energy, fibre and vitamins, contains potassium which can contribute towards a lowering of blood pressure, is low in fat and cholesterol and releases important chemicals in the brain – neurotransmitters – serotonin and dopamine that contribute towards our moods, emotions, and control mechanisms. When we think of bananas, we think about monkeys and banana countries like Latin America, Costa Rica, etc. I also remember Turkey’s first woman prime minister Tansu Çiller’s speech about bananas: “We are not a banana country”. However, banana is also important for the EU countries. EU countries make banana trade with such countries. In my term paper, I want to demonstrate you that there is a banana problem and how difficult to solve and understand the banana problem. 2. WHAT WAS THE ARGUMENT ABOUT? Bananas are produced in countries with a predominantly tropical climate – primarily in Central America, Africa and the Caribbean. Here is where the main problem lies. In 1993 the EU sought to protect banana producers from its former colonies – mostly in Africa and the Caribbean – by imposing tariffs and quotas on bananas from other growers – the so called ‘dollar bananas’. This upset the US who argued that free trade was being restricted – especially affecting producers in countries with which it had ties. (Chiquita for example, donated half a million dollars to the Democratic Party!) The US imposed retaliatory tariffs on a range of European goods before the World Trade Organization brokered the deal between the two in April 2001. As you see here, banana is very important for the EU and the world, and as I’ve written before, the banana is easy to eat, high in energy, fibre and vitamins, contains potassium which can contribute towards a lowering of blood pressure, etc. I think that’s why the banana is very important for the EU and the world. In the deal, the EU agreed to remove the restrictions and set up a single tariff for all bananas. The process would occur in stages, with the final tariff being in place by 2008. The problem now facing the EU is that a reduction of the tariff, favored by the ‘dollar banana’ states, would represent real problems for the producers in the Caribbean and parts of Africa. The tariff is currently at €75 per tone (£52), ($1.60 or 88p per box) and some producers estimate that the new tariff could be anything between this level and €300. Anything at the higher end would cause massive job losses in countries such as Costa Rica in Central America. At the same time, the popularity of the banana in countries like the UK can be partly put down to the relatively low price. Low prices however tend to mean that someone somewhere is getting squeezed and the suspicion is that the burden is falling on the primary producers. It is estimated that the farmer might get around 10% of the price of a banana with workers getting anything from 9% in the case of Fair-trade bananas to as little as 1.5% on traditional farms. In comparison the trading company – the likes of Del Monte, Chiquita, Dole and Fyffe’s could be getting up to a third of the price whilst retailers take around 40%. In the case of Fair-trade bananas, the cut for the retailer could be as low as 15%. As you see, banana brands manage the banana industry. I remember what Turgut Özal did in 80s. In 1984, Turkish bananas changed to importation bananas. Turkish bananas were small. However, new bananas which Turkey met with and called Chiquita were large and there were dockets on them. The dockets on bananas looked strange for Turkish people, because there were no dockets on Turkish bananas. Nobody thought a banana brand could be. Chiquita bananas were the first products of free trade economy which was one of the first decisions in 24.01.1980. It was the start point of globalization in Turkey. Banana producers from Antalya didn’t like the situations. Banana became a problem in Turkey, too. Turkish banana producers claimed that Turkish bananas are small but more tasteful. The bananas which were coming from Africa were large but there were hormones in each of them. The first Chiquita bananas were served to Turgut Özal and nobody could forget the image which they saw in TRT in Turkey. Turgut Özal was proud of the banana importing. Then, Turkish bananas were exported to other countries. That’s why in 90s, Tansu Çiller said: “We are not a banana country”. The decision which I’ve written above by the EU is therefore being watched carefully by the world’s banana producers and distributors with a keen eye; the EU seems to be on a hiding to nothing with the tariff it sets – likely to please nobody and anger everyone for different reasons. The issues surrounding the banana industry are very complex. They not only involve economic issues but are also linked with political ones – many of which go back in history. Turgut Özal and Tansu Çiller events which I’ve written before are an example for the political issues. However, let me open it more. The problem centres on the relationship between the growers, the main distributors. The industry can be described as an oligopoly dominated by five main growers. The two biggest are Chiquita and Dole who together account for around half the total market. Del Monte, No boa – an Ecuadorian based group and Fyffes take the remainder of the market. Each company is involved in the whole supply chain of bananas and there is evidence of vertical integration having taken place throughout the development of these companies. Because of their size, they benefit from significant economies of scale and whilst they are in a position to be able to benefit from these, the ‘victims’ are those that have to submit to their power, they are in a position of being a ‘monophony’ – the only or dominant buyer in an industry. Some would suggest that as a result they have been in a position to exploit growers who themselves have very little market power. Whilst pressure may exist on growers to lower costs, supermarkets around the world seem to be making large profits on bananas – there may be an ethical issue suggesting they are making profits on the back of exploited and oppressed growers. Other ethical considerations include the amount of chemicals used to produce bananas and the way in which workers handling those chemicals are exposed to health and safety risks. Other issues surround the imposition of tariffs and quotas worldwide. The European Union and the USA account for around two thirds of all imported bananas world wide. Europe’s colonial history means that there are close historical ties with former colonies in African, Caribbean and Pacific countries, some of whom are major banana producers – so called ACP bananas. On the other hand, bananas produced in Central and South America by countries such as Costa Rica, Ecuador, Venezuela, Honduras and Panama are termed ‘dollar bananas’. There are two main reasons for this; one is that these countries are heavily influenced by the US dollar and secondly, banana producers in these countries have close links to US based companies like Chiquita and Del Monte. Again, we see the most famous banana brands; Chiquita and Del Monte are very important for the EU and the world. It seems, when we go to another country, we can find Chiquita and Del Monte bananas easily. These brands play an important role in the banana problem. They represent a lock point in the world trade. They dominate the banana industry in the world. When we were a child, we knew the brands. However, we didn’t know how they dominate the world trade and economy, I think. We used to say “I want large Chiquita banana” when we were a child. The importation bananas looked strange to us. However, we didn’t know how they are important in politics and economy. The 12 main ACP countries have a tariff free quota of 857,700 tones per year with each country having a license to sell their bananas to the EU. Originally, ‘dollar bananas’ were subjected to a quota of 2 million tones but had to pay a €100 per tone tariff. This was amended to 2.1 million tones at €75 per tone. Companies wishing to export bananas to Europe had to apply for export certificates and import licenses; the latter being subject to being traded themselves to enable producers’ access to European markets. The major problem is that costs of production in ACP countries are quite different to those in ‘dollar banana’ countries. The terrain and facilities may mean that costs of production are twice as high as in some of the larger ‘plantation’ based countries of Central and South America. In addition, transport and distribution costs tend to be much higher. Costs of dollar bananas can be as much as a third lower than the European producers. Given these cost differences the opportunities for ACP countries to compete is rendered more difficult. The tariff and quota structure was supposed to help ‘even out the playing field’ for ACP countries. In reality, it angered the ‘dollar banana’ producers and led to a bitter trade war between the US and Europe. At the heart of this dispute is the theory of competitive advantage, which states that countries should specialize in producing goods in which they have a lower opportunity cost and engage in trade. In so doing, everyone will be better off. However, the acts of market failure also tell us that when price signals do not work effectively, there will be inefficiencies in the market and firms acquiring market power will be able to exploit the market. As has already been mentioned, the banana producers are so large they are able to exert, what may be considered, undue pressure on those who have very little market power – the growers – in order to maintain some form of competitive advantage. As you read, there is a hidden bitter trade war between the US and Europe. Isn’t that a proof about the banana is a very big problem in the world? According to me, yes, it is. The World Trade Organization (WTO) set up in 1995, investigated the EU system following complaints by ‘dollar banana’ countries. There followed a six-year debate on the issue with claim, counter claim and extensive investigation by the WTO. The modifications to the protection system by the EU are likely to have winners and losers and the issue of exactly what the new tariff will be is likely to be crucial to determining who will be the winners and who will end up as losers. There are certainly a number of countries that rely on banana exports that are anxiously awaiting the news. Yes, a banana is just a fruit. However, as you see, the banana is a destiny for such countries that rely on banana exports that are anxiously awaiting the news. If they got the chance, it can change their country’s destiny. However, the same banana can be a problem for their country, too, because the banana affects their economies. An important factor related to banana trade is the issue of banana market access. There are different banana import regimes in different countries. Actually, the diverging banana regimes have fragmented the international banana market into open market areas and preferential market areas. Many banana importing countries maintain different forms of banana import regimes. According to FAO, there is a direct relationship between high import barriers of a tariff, TRQ (Tariff Rate Quotas) or regulatory nature and low per caput consumption of bananas. Another problem of market access is the application of sanitary and phitosanitary (SPS) measures to banana imports, because they may be understood by exporting countries by an additional barrier to trade. For example, in 2001 Ecuador expressed in the WTO context concerns about the use of SPS measures in Turkey to hamper trade . The initiative was initiated under the frame of the multi-years schemes of the Generalized System of Preferences (GSP). This agreement, signed on February 26, 2001, provides Least Developed Countries (LDCs) with a free access to the European Market. There is a transitory period to grant duty-free access for three commodities, including for fresh bananas for which EU imports tariff was about 700 euro per tone in 2001. For this commodity, the cut-off date of the transitory period will be January 2006, date from which import tariff, after a phase of progressive reduction, should reach zero. I think this is a proof that developed countries need undeveloped countries and undeveloped countries need developed countries. It can be a problem for them, in my opinion, because the systems of such countries are different even there are some agreements between developed countries and undeveloped countries. Developing countries exporting bananas have been strongly affected by the evolution of the complex tariff quota system of the EU Banana Regime established in 1993 and the trade disputes that followed at the WTO. In particular, some countries with a clear dependence on their banana exports, such as ACP countries. During the nineties, the world banana market has been dramatically influenced by the developments of the EU Banana Regime and the corresponding dispute that took place at the WTO Dispute Settlement Body. The banana regime and its modifications following the dispute have filled the international banana market with uncertainties and have clearly determined the strategies of banana producers in the different areas (with different reactions coming from “dollar” bananas, ACP or EU producers), of transnational banana marketing companies and banana distributors, while it affected consumer demand. Expecting further liberalization of the EU banana market and in anticipation of new market opportunities, banana producers and marketers expanded their production capacity during the late eighties and early nineties. The delay in such liberalization is one of the major reasons behind the oversupply situation in the world banana market and the subsequent falling international banana prices. The dispute was one of the most controversial issues in the world banana market in the last century and it resulted in a clear damage for banana trade as well as disruptions for international trade in general. – Germany imported bananas from Latin America on an open market basis, without any import restriction. Under a special protocol of the Treaty of Rome Germany had a zero tariff on banana imports within an annual banana quota that was sufficient to cover market requirements. – Preferential access, based on protection to local production or to certain countries or areas with whom there were historical links, was given in countries like France (for overseas territories of Guadeloupe and Martinique and some African countries such as Côte d´Ivoire or Cameroon), Portugal (Madeira), United Kingdom (preferences given to imports from Caribbean countries such as the Windward Islands and Jamaica), Spain (bananas were provided mainly by local producers of the Canary Islands) and Italy (Somalia). – The remaining countries imported bananas, mainly from Latin America, without any quantitative restriction, on a 20% common tariff basis. The creation of the European Single Market in 1993 imposed the need to harmonize this variety of banana import regimes in the EU. Therefore, the EU put in place the Common Market Organization for bananas (EU Banana Regime concerning the importation, sale and distribution of bananas), under Council Regulation (EEC) No 404/93 of 13 February 1993 on the Common Organization of the Market in Bananas. The objectives in which the EU Banana Regime was based were: the elimination of internal barriers to trade in order to allow the free circulation of bananas within the EU; the maintenance of preferences for former colonies in order to protect production (ACP producers, who had traditionally exported bananas to the EU, could not be put in a less favorable situation than in the past, under previous Lomé Convention preferences); the protection of local producers in order to maintain their level of income, as well as the granting of more opportunities to EU produce distribution companies. In addition, third countries suppliers were also to be taken into account since they provided around 60% of total bananas required in the EU. § Category A: 66, 5% of the quota reserved to established operators for third country (dollar) and non-traditional ACP bananas (mainly USA transnational companies). § Category B: 30% of the quota for established operators who marketed EU and ACP bananas (European companies). duty for ACP countries, in line with obligations under the Lomé Convention. In addition, in order to prevent any loss of income for EU banana producers, compensation payments, in case prices fell bellow production costs, were limited to a maximum of 854,000 tones. Specific quotas were assigned to individual EU regions, almost 50% going to Canary Islands. July 1, 2001, the EU was to adopt a new system of banana licenses based on historical reference periods, 1994-1996. On this date, U.S. Trade Representative announced the lifting of sanctions (valued $191 million) on European products, as the EU opened market to U.S. banana distributors by the increased license allocations. January 1, 2002, the EU would shift an additional 100,000 tones of bananas (from ACP tariff free quota) into a tariff quota to which bananas of Latin American origin have access. As a result of the agreement, 83% of EU banana import licenses were for established banana importers and the remaining 17% was for newcomers into the EU banana trade since 1994. This means that the B quota would be increased by 100 000 tones, and the C quota would be reduced by the same quantity. The C quota would be reserved exclusively for bananas of ACP origin, subject to a WTO GATT Article XIII waiver. The US agreed to help achieve this waiver. On completion of this step, the US was to remove the sanctions definitively. January 1, 2006, the EU will introduce a tariff only regime for banana imports. The EU will begin negotiations with producing countries necessary under WTO rules in good time to introduce this system. Following intense negotiations at the Fourth Ministerial WTO Conference in Doha in November 2001, WTO waivers were granted regarding obligations under article I (permitting continued tariff preferences for ACP imports, contained in the Cotonou Agreement) and article XIII of the GATT (permitting the reservation of the C quota to ACP bananas). In December 2001, the EU Ministers agreed to modify the EU import regime for bananas in order for the US and Ecuador definitively to lift sanctions against the EU, adopting regulations for the EU’s new banana-import system, formally marking an end to the long-running dispute. Other technical modifications, which relate to the financing of producer organizations, an update of the tariff and statistical nomenclature of the products and new rules on compensatory aid, have also been included. On January 26th 2005, six Heads of Latin American States -Colombia, Costa Rica, Ecuador, Guatemala, Honduras and Panama- met in Quito, Ecuador, in order to discuss the European union decision to increase its tariffs applied to imports of Central and South American bananas beginning January 1st 2006. In January 2005, the EU banana regime consisted of import quotas and a duty rate of 75 dollars per ton. The EU goal that should come into force in January 2006 should introduce a flat tariff rate of 230 dollars per ton on bananas as well as a series of quotas. According to the former World Bank economist, Brent Borrell, this measure should make Ecuador as well as other Latin American banana producers (including Panama and Honduras) less competitive in the European market vis-à-vis African ones and especially those of Côte d’Ivoire and Cameroon. In Quito, the Heads of States turned down the EU proposal and scheduled a forthcoming meeting on February 14th and 15th 2005 in order to draw up a joint proposal for further negotiations with the EU. 7.1. Food and Agricultural Organization-Intergovernmental Group on Bananas and Tropical Fruits: Considered as the International Commodity Body on Bananas, it is the main forum for in depth discussion on issues related to the banana economy, its problems and their appropriate remedial measures. The Group provides a forum for consultation on and study of economic aspects of production, marketing, trade and consumption of bananas, with special reference to relations between consumption and prices, income, trade barriers and distribution systems, and the possibilities of increasing world consumption; study the efficiency and social aspects of the banana industry with particular emphasis on improvement of living standards of those engaged in the industry; study economic problems of the banana industry and make recommendations for marketing high-quality bananas at prices that are fair to both producers and consumers. As you see here, it is the main forum for depth discussion on issues related to the banana economy and its problems. This is a proof that banana industry has got problems. If there weren’t problems, why do they need issues related to banana problems? FAO established recently an ad-hoc working group on responsible horticulture production and trade with the purpose of facilitating dialogue, collaboration and joint activities among stakeholders working with social and environmental issues in horticultural production and trade. The participants in the Working Group have various backgrounds, including NGOs involved in standard setting, certification and/or labeling of horticulture produce, auditors and environmental experts, banana producers and FAO. As you see, banana is a very serious problem in industry. In industry, banana has got its own issues, area, agreements, co-operations and problems. And I want to emphasize again that all these information are a proof that banana is an important issue and has got problems. In addition, the Banana Forum service is provided by the Horticultural Products Group of FAO. The aim of the network is to exchange information on developments in the world banana industry and to discuss social, economic, trade, environmental and other relevant issues in banana production and trade. 7.2. Union of Banana Exporting Countries (UPEB): UPEB is the international organization of the producing and exporting countries, which was created in 1974 with the idea of functioning as a cartel for bananas, in order to control banana supply and demand. However, it did not work out like that because of coordination problems and lack of enough financial resources. I think if even an organization to control banana supply and demand can’t control the coordination problems, it shows us how big banana problem is. Anyway, member countries include Colombia, Costa Rica, Guatemala, Honduras, Nicaragua, Panama, Dominican Republic and Venezuela. The objectives of the organization were to expand markets and defend remunerative and fair prices for banana exports. The UPEB aimed to improve technical cooperation among member countries as well as to achieve marketing improvements for better developments of banana activity. During the nineties, as a result of different views and attitudes of member countries in relation with the EU Banana Regime, the role of UPEB was reduced. The fact that Ecuador, the first exporter did never become a member equally contributed to limit its influence. Under a cooperation agreement with IICA (Interamerican Institute for Agriculture Cooperation), it was transformed into a centre of information and documentation for member countries, avoiding intervention policies on prices or production. The UPEB was to become a discussion forum for Latin American banana producing countries, paying more attention to technical, environmental and social questions. Lately, some voices have been raised asking for a reactivation of UPEB as an organization uniting the interests of banana exporting countries with the objective of attaining social, economic and environmental sustainability of the banana activity in developing countries. 7.3. Caribbean Banana Exporters Association (CBEA): CBEA evolved from the Commonwealth Banana Exporters Association, which was formed in 1972 to bring together the Banana Growers’ Associations in Jamaica and the Windward Islands, who were the traditional suppliers to the UK market. Following the Lomé Convention Agreement in 1975 the Commonwealth Banana Exporters Association changed its name to the Caribbean Banana Exporters Association (CBEA) and was expanded in due course to include Belize and Surinam. It established a London lobby in 1988 to defend its rights during pending trade discussions. The CBEA has been involved in campaigning against WTO rulings against the EU Banana regime. As you see from all these organizations, there is a big effort to solve banana problems since 1970s. In my opinion, if all these developed and undeveloped countries couldn’t solve the problems in the way they wanted for many years, it is a proof to my thesis that banana is not a small problem. 8.1. International Banana Association: Founded in 1982, the International Banana Association (IBA) is a trade organization consisting of members engaged in the business of importing bananas into the United States. IBA provides a forum for members to discuss common and technical issues pertaining to banana production, distribution and marketing. IBA represents the interests of the banana industry in government relations and general promotions. The association works with government agencies to encourage a sound international business and regulatory climate for the banana industry. IBA also assists in the promotion of bananas to enhance public awareness of their health and nutritional qualities. European Community Banana Trade Association is the European representative association of the banana trade in Europe. It was established in 1992 and its members are companies which are trading bananas on the European market. The association’s main task is to represent unanimous views of members on aspects relating to the CMO on bananas, its overall framework and its detailed management rules. It is also a platform of information for members and provides them with regular updates on the coming developments on legislation. As you see, banana affects the private sector, too. Do you still think that banana is just a fruit that adorns our dining table? I think everybody can understand banana is not a simple fruit after reading my term-paper. It is very important, because its problems affect private sector, economy, governments, international relations, organizations, etc. Now, I want to show you how non-governmental organizations affect banana industry. Non-governmental organizations are not products of the government. They work free from the government, as you know. However, NGOs’ activities are important for the governments. So, NGOs can affect the banana industry. Don’t you think like me? Let me show you some information. During the nineties there has been an increasing participation of civil society in many aspects of life. Banana production has many environmental and social effects that are of concern for many people. As a result there are some NGOs directly involved in raising awareness on the banana sector and having an influence in increasing consciousness on the need to consume more organic and fair-trade bananas, as well as campaigning for a more environmentally and socially sustainable banana activity. An interesting example is Banana Link, a non-profit company limited by guarantee established in early 1996 to develop the work on the international banana trade started by Farmers’ Link. It aims to alleviate poverty and prevent further environmental degradation in banana exporting communities and to work towards a sustainable banana economy. This is to be achieved by working co-operatively with partners in Latin America, the Caribbean, West Africa and the Philippines and with a network of European and North American organizations. Banana Link carries out research provides educational services and disseminates information on the banana trade. It provides a specialized research and information service on trends in the international banana trade and on the activities of the companies involved, campaigns and lobbies, nationally and internationally, for a more socially and ecologically sustainable banana production and trade, works with and supports small banana farmers and plantation workers in producing countries and collaborates with other organizations working on similar issues in the rest of Europe and elsewhere. There are other European initiatives, grouped in Euroban, the European Banana Action Network, is a coalition of 30 European NGOs, working for a socially and environmentally sustainable banana trade. In the US, Rainforest Alliance is working in the Better Banana Project. In 1998 took place a world conference bringing together all players in the global banana industry in search of a sustainable banana economy. The International Banana Conference was organized by IUF (International Union of Food workers) and its partners in the European Banana Network EUROBAN, including trade unions, transnational companies, governments, civil servants, scientists, fair-trade organizations and NGOs to discuss concrete measures “towards a sustainable banana economy”. On the conclusions, the “International Banana Charter” was presented, as a basis for further discussion at all levels of the industry. The Charter defines the social, environmental and economic components of a future sustainable banana economy and outlines the potential role of social and environmental clauses in WTO agreements, freedom of association and collective agreements, corporate codes of conduct fair-trade and reform of the European Union banana import regime in transforming the industry. After the Conference, there have been many voluntary initiatives trying to address social and labor issues in the banana industry. All parties share the objective of raising the standards of the people employed on plantations in banana exporting countries. Could you solve the banana problem? If I should admit about my mind, I couldn’t solve the banana problem. Actually, in my term paper, my aim wasn’t to solve the banana problem, because nobody could solve the problem yet. Even governments, developed countries, undeveloped countries, the EU, non-governmental organizations, banana brands, politicians, banana producers, private sector, etc. couldn’t solve the banana problem with co-operations, agreements, meetings. They try to solve the problem. If you couldn’t solve the banana problem, too, I am successful about my term-paper, because I just wanted to show you that there is a banana problem and this problem is not easy to solve. This problem is difficult to solve. Bananas are produced in tropical countries like Central America, Africa, and the Caribbean and start a journey under the control of developed countries. The popularity of the banana in some countries can be partly put down to the relatively low price. I think the price creates problems, too. Banana brands such as Del Monte, Chiquita, Dole and Fyffe’s are very important in the banana industry. They dominate the banana sector. Banana affects the politics, too. For example, in Turkey, Tansu Çiller and Turgut Özal events affected Turkish politics. Banana is very important for the EU. The EU watches the banana industry very carefully. There is also a banana war between the EU and the US. I think just this example is an evidence that there is a big banana problem. ACP countries have centered on a number of agreements. If banana wasn’t a problem, could countries do agreements about bananas? ACP countries even have got licenses to sell their bananas to the EU. The major problem is that costs of production in ACP countries are quite different to those in ‘dollar banana’ countries. The banana looks innocent while you are eating it, doesn’t it? However, as you have just learned, the same banana make governments, developed countries, undeveloped countries, the EU, non-governmental organizations, banana brands, politicians, private sector and banana producers live difficult things before it comes to your house. The large revenues of the Costa Rican banana industry have come at the expense of one of the world’s most biologically diverse rain forests. Recently, the EU installed a quota system for bananas predominantly from Latin America. The Costa Rican banana industry has been hit hard and the delicate balance between business and environmental protection has been affected. There have been many protests to bring an end to the EU banana quota system, including protests to the GATT. The US government is now at the forefront of forging negotiations in the trade dispute because US fruit conglomerates are suffering, whereas the European fruit counterparts are benefiting. The resolution, if any, of the greater international dispute over world banana trade will inevitably have an effect on ecological/banana industry relationship in Costa Rica. 2.What was the argument about? In the UK alone we eat in excess of 140 million bananas a week – that’s around 7 billion a year. World wide, the trade in bananas exceeds 2.5 billion tones each year. The popularity of the fruit throughout the world is enhanced by the fact that it is easy to eat, high in energy, fibre and vitamins, contains potassium which can contribute towards a lowering of blood pressure, is low in fat and cholesterol and releases important chemicals in the brain – neurotransmitters – serotonin and dopamine that contribute towards our moods, emotions, and control mechanisms. Bananas are produced in countries with a predominantly tropical climate – primarily in Central America, Africa and the Caribbean. Here is where the main problem lies. In 1993 the EU sought to protect banana producers from its former colonies – mostly in Africa and the Caribbean – by imposing tariffs and quotas on bananas from other growers – the so called ‘dollar bananas’. This upset the US who argued that free trade was being restricted – especially affecting producers in countries with which it had ties. (Chiquita for example, donated half a million dollars to the Democratic Party!) The US imposed retaliatory tariffs on a range of European goods before the World Trade Organization brokered the deal between the two in April 2001. In the deal, the EU agreed to remove the restrictions and set up a single tariff for all bananas. The process would occur in stages, with the final tariff being in place by 2008. The problem now facing the EU is that a reduction of the tariff, favored by the ‘dollar banana’ states, would represent real problems for the producers in the Caribbean and parts of Africa. The tariff is currently at €75 per tone (£52), ($1.60 or 88p per box) and some producers estimate that the new tariff could be anything between this level and €300. Anything at the higher end would cause massive job losses in countries such as Costa Rica in Central America. At the same time, the popularity of the banana in countries like the UK can be partly put down to the relatively low price. Low prices however tend to mean that someone somewhere is getting squeezed and the suspicion is that the burden is falling on the primary producers. It is estimated that the farmer might get around 10% of the price of a banana with workers getting anything from 9% in the case of Fair-trade bananas to as little as 1.5% on traditional farms. In comparison the trading company – the likes of Del Monte, Chiquita, Dole and Fyffe’s could be getting up to a third of the price whilst (iken) retailers (parekendeciler) take around 40%. In the case of Fair-trade bananas, the cut for the retailer could be as low as 15%. The decision by the EU is therefore being watched carefully by the world’s banana producers and distributors with a keen eye; the EU seems to be on a hiding to nothing with the tariff it sets – likely to please nobody and anger everyone for different reasons. The issues surrounding the banana industry are very complex. They not only involve economic issues but are also linked with political ones – many of which go back in history. The problem centres on the relationship between the growers, the main distributors. The industry can be described as an oligopoly dominated by five main growers. The two biggest are Chiquita and Dole who together account for around half the total market. Del Monte, No boa – an Ecuadorian based group and Fyffes take the remainder of the market. Each company is involved in the whole supply chain of bananas and there is evidence of vertical integration having taken place throughout the development of these companies. Because of their size, they benefit from significant economies of scale and whilst they are in a position to be able to benefit from these, the ‘victims’ are those that have to submit to their power, they are in a position of being a ‘monophony’ – the only or dominant buyer in an industry. Some would suggest that as a result they have been in a position to exploit growers who themselves have very little market power. Whilst pressure may exist on growers to lower costs, supermarkets around the world seem to be making large profits on bananas – there may be an ethical issue suggesting they are making profits on the back of exploited and oppressed growers. Other ethical considerations include the amount of chemicals used to produce bananas and the way in which workers handling those chemicals are exposed to health and safety risks. Other issues surround the imposition of tariffs and quotas worldwide. The European Union and the USA account for around two thirds of all imported bananas world wide. Europe’s colonial history means that there are close historical ties with former colonies in African, Caribbean and Pacific countries, some of whom are major banana producers – so called ACP bananas. On the other hand, bananas produced in Central and South America by countries such as Costa Rica, Ecuador, Venezuela, Honduras and Panama are termed ‘dollar bananas’. There are two main reasons for this; one is that these countries are heavily influenced by the US dollar and secondly, banana producers in these countries have close links to US based companies like Chiquita and Del Monte. The major problem is that costs of production in ACP countries are quite different to those in ‘dollar banana’ countries. The terrain and facilities may mean that costs of production are twice as high as in some of the larger ‘plantation’ based countries of Central and South America. In addition, transport and distribution costs tend to be much higher. Costs of dollar bananas can be as much as a third lower than the European producers. Given these cost differences the opportunities for ACP countries to compete is rendered more difficult. The tariff and quota structure was supposed to help ‘even out the playing field’ for ACP countries. In reality, it angered the ‘dollar banana’ producers and led to a bitter trade war between the US and Europe. At the heart of this dispute is the theory of competitive advantage, which states that countries should specialize in producing goods in which they have a lower opportunity cost and engage in trade. In so doing, everyone will be better off. However, the acts of market failure also tell us that when price signals do not work effectively, there will be inefficiencies in the market and firms acquiring market power will be able to exploit (sömürmek) the market. As has already been mentioned, the banana producers are so large they are able to exert, what may be considered, undue pressure on those who have very little market power – the growers – in order to maintain some form of competitive advantage. 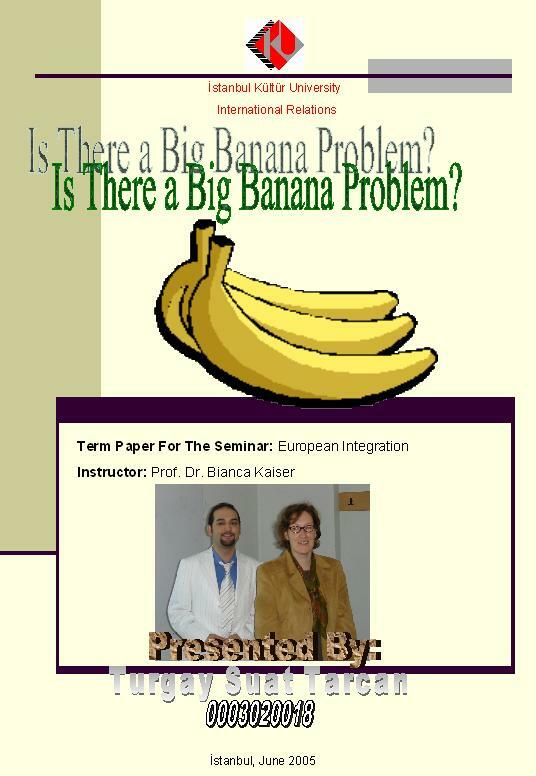 Produce a presentation to contribute to a debate on the future of the banana industry. Each group will be expected to consider the history of the banana industry, the impact of the changes in the tariff and quota positions by the EU and the concerns over the ethical and environmental issues surrounding the production of bananas. Your presentation should make use of appropriate economic and business theory throughout using appropriate diagrams to reinforce your position. The presentation by each group will be followed by a debate in which the positions will be taken into account. This will produce an action plan for the future of the industry that goes some way to satisfying the needs and aspirations of all in the debate. « Does university prepare for the work?